A drop off spot for coats, shoes, kids stuff and anything else you want to find quickly. This drop zone has upper and lower cubbies, coat hooks with letter inlays that spell "family"), and dual closets. Wainscoting adds formality to this traditional laundry room design, complete with a custom drop zone. The size of this drop zone is 366x244. An open archway leads from the breakfast room and kitchen to this tucked-in mudroom space. 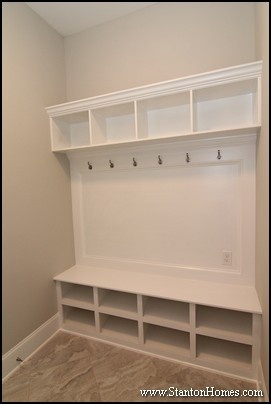 While many mudrooms are built into the laundry room, this drop zone was integrated in a stand-alone storage space. Upper cubbies are perfect for hats, gloves, purses and light weight items to grab on the way out. Lower cubbies double as a bench seat. The size of this drop zone is 366x562. This drop zone fits into a space that would otherwise be unusable. But it still has big, bold cubbies and a place to sit or stack things. The size of this drop zone is 366x549. This drop zone provides storage space you can close off, with the clean appeal of hinged cover bins. Closable cubbies like these are especially popular for kids toys. Coat hooks add even more practicality. 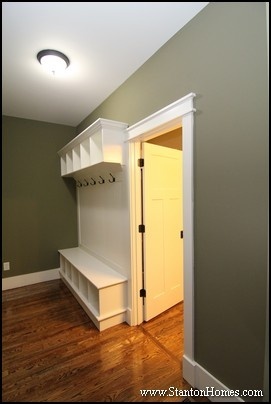 This mudroom, tucked between the garage and kitchen, has a place for everything, with the drop zone as its focal point. 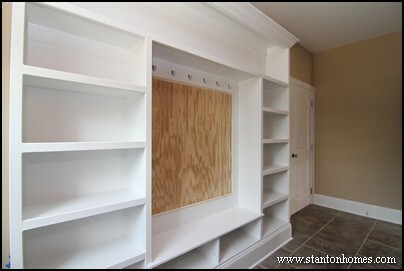 The full wall of custom built in shelving offers open concept storage. Hooks in the center section are great for coats, purses and keys. 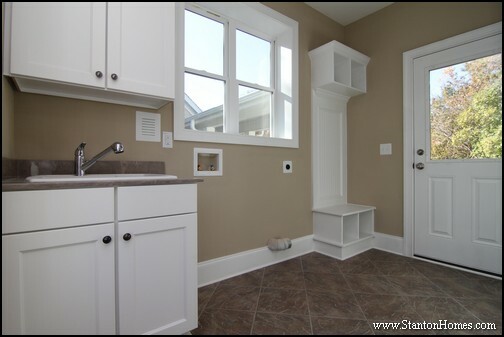 The drop zone's location right across from a sink and cabinets makes this space even more usable. The size of this drop zone is 366x249. 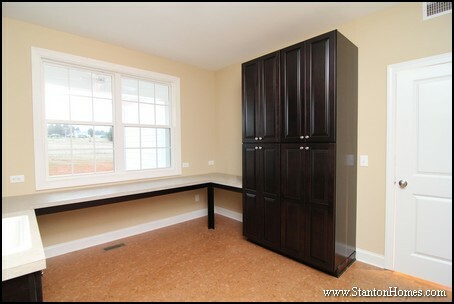 This drop zone comes with cubbies, hooks, bench - and a window. The size of this drop zone is 366x557. This drop zone is packed full of cubbies, so it's easy to see, store and grab on the go. Designed for traffic flow, it's location right outside the laundry room makes it easy to access. Cubbies are sized perfectly for colorful buckets or baskets. The size of this drop zone is 366x256. This drop zone doubles up shoe space, with dual layer cubbies designed for footwear. Hooks can be placed by your custom home builder to add more hanging space, too. Open storage at the top can double up as a place to put things out of reach of little ones. The size of this drop zone is 366x552. 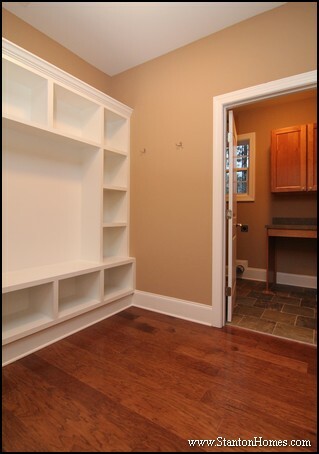 This drop zone says "mud room" with focus on transitioning from wet to warm. Hooks for coats and sweaters. Cubbies for boots and shoes. A small ledge at the top can hold keys. The laundry sink across the way cleans everything up. If you're able to plan ahead, try to keep your mudroom at least 5 feet wide. This will allow space for a standard hallway (3 feet wide) and a spacious bench and/or row of cabinets or lockers (2 feet wide). If a hallway is tight, however, a 4' width can work - plan for a 12" wide Drop Zone, with 12" depth base cubbies instead of a bench. While there is no "standard size" for a mudroom, you can still determine the room dimensions and features that work best for your family routines. Use the questions below to reveal your ideal mudroom design, including the best flooring, storage, layout, and location. 1. Who is the mudroom for? 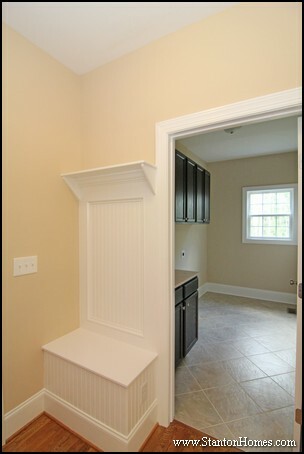 Is the mudroom for you, kids, pets, or guests? Black chalkboard paint turns this mudroom into a family message center. Compare this mudroom to another designed for young kids. What differences do you see? 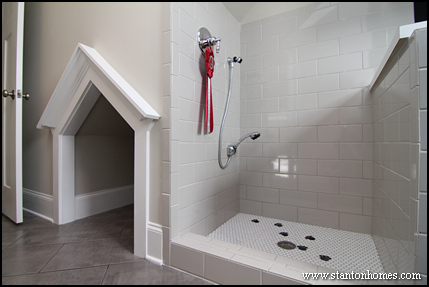 This third mudroom is designed for pets - with a dog shower and house. Design Tip: No matter who will use the mudroom, the flooring should be durable and easy to maintain. Your mudroom will become the center of dirt, mud, water, paw prints, and finger prints, and other messes. Materials like tile or vinyl, rather than hardwood, tend to stand up to water exposure. 2. How often will you use the space? Are you considering mudroom spaces for daily routines, weekly chores, or long-term storage? One reason to include a mudroom is to create a space dedicated to all home entry and exit activities. You'll want to include some sort of bench or seat (with storage below). 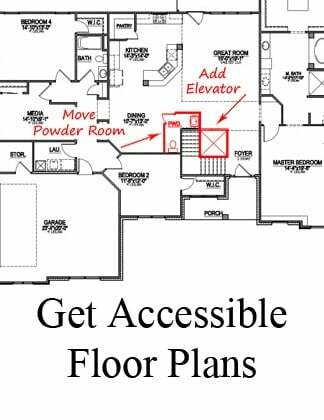 Typically, this also means locating the mudroom entrance near the garage, so the room can serve as a buffer space between the car and home. In many two story house plans, the laundry room is placed upstairs near all bedrooms while the mudroom remains downstairs. 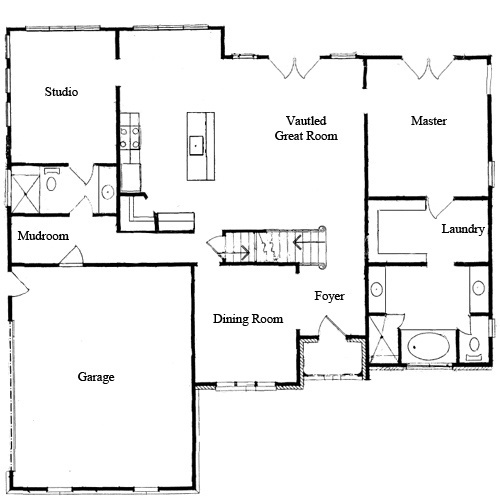 In one story or downstairs master house plans, the mudroom may or may not be connected to the laundry. 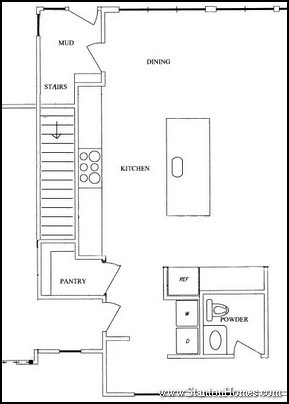 In this example, the mudroom serves as a central point between the garage, laundry room, walk in pantry, and kitchen. The mudroom - designed for daily use - will need to stay tidy given its constant visibility to you and your guests. Another reason to include a mudroom is for long-term storage space for things like coats, boots, umbrellas, and sports equipment. 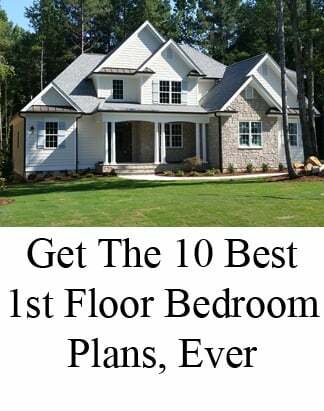 If you're leaning towards trying to organize oversized equipment, also consider adding a few feet of width or even a "workshop" area to the garage or unfinished walk-in attic space. 3. Do you need an dedicated mudroom? 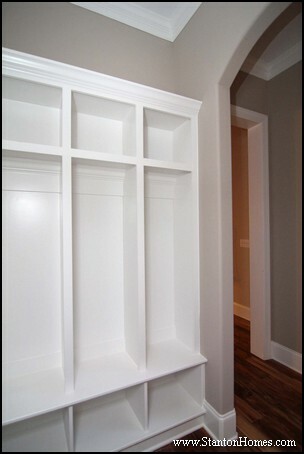 Or will a hallway drop zone storage system meet your needs? Remember that your mudroom should work for you. House plans often use drop zones and mudroom style storage systems as a way to take advantage of un- or under-used hallway space. While you may need to keep the space more tidy in a hallway than in a room with a door that can hide the area, you won't "waste" any sq ft in your home. In this example, the mudroom is actually a hallway leading from the garage to main living areas. 1. Who is the mudroom for, yourself, kids, pets, or guests? 2. How often will you use the space - every day, weekly, or long-term? 3. Will a hallway, rather than dedicated room, do the trick? 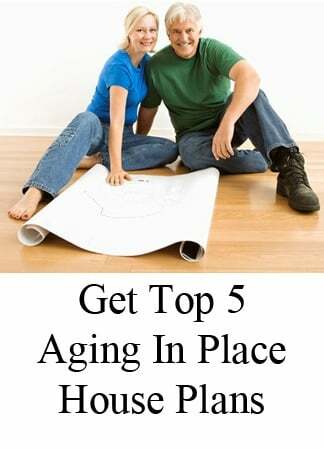 What is most important to you, inside your Raleigh new home? 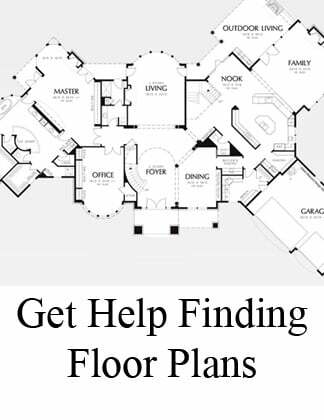 Discuss, design, and decide what your next home should look like, with tens of thousands of floor plans to choose from. 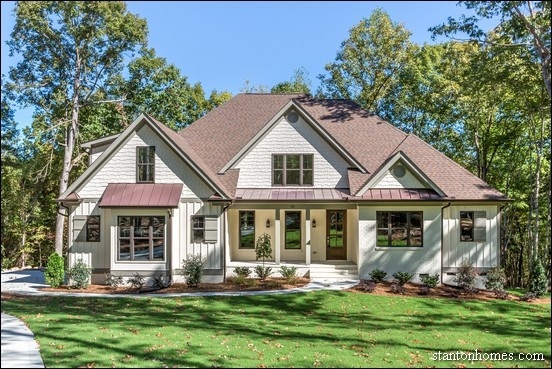 Contact Stanton Homes at 919-278-8070 or visit www.StantonHomes.com to learn more about building an NC custom home - with the help of an interior design expert throughout the selection process. Get ideas from these seven mudroom drop zones, designed with different types of storage, uses, and configurations. This family drop zone comes with upper and lower cubbies, coat hooks (each with a letter inlay that spells "family"), and dual closets. One closet features shelving, designed for storing soaps, buckets, and small house cleaning items. The other closet features a full height design, crafted to fit tall items such as mops, brooms, and a vacuum. The upper cubbies are perfect for storing light-weight items you use less frequently. The lower cubbies double as a bench seat. These cubbies are sized perfectly for adding colorful buckets or labeled baskets. A small nook, short hallway, or under-stairs wall can be the perfect place to add built-in storage units. 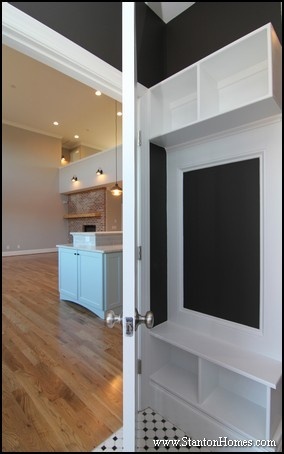 In this Raleigh custom home, dual drop zones offer double the built-in storage - with a unit on each wall of the hallway. For a design like this, consider assigning each family member their own cubby column (you can even personalize each section with name labels). 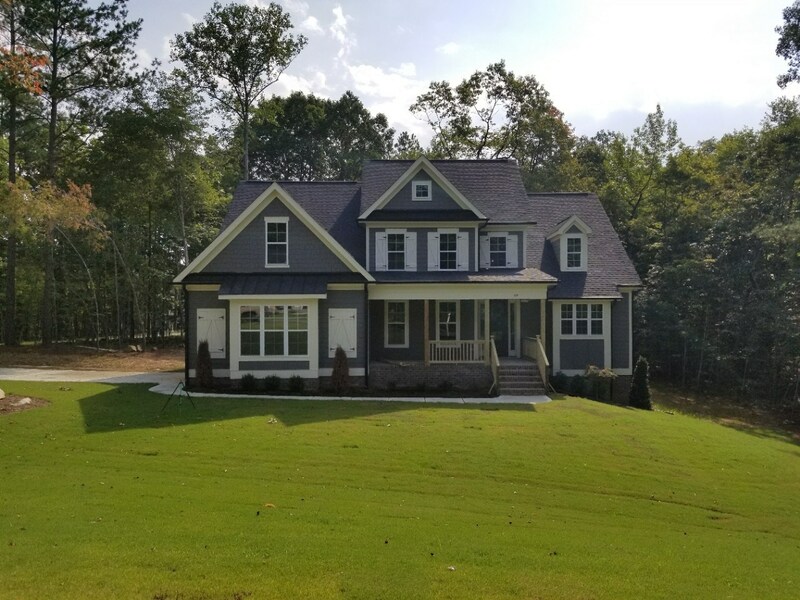 Talk to your builder about the flexibility of your floor plan layout, or ask Stanton Homes how to custom design a home packed with usable space and creative storage solutions. 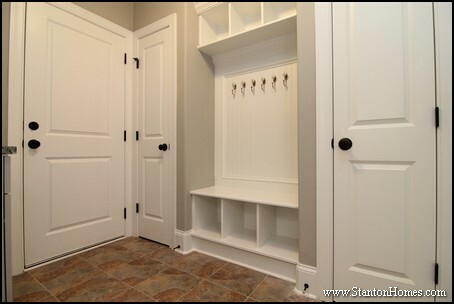 This mudroom space - steps away from the laundry room - offers ample long-term storage space. In this storage design, cubbies form a full rectangle, with center wainscoting design (the perfect place to add coat hooks). In this design, the tile laundry room acts as a transition area between the garage and mudroom storage area. This mudroom, tucked between the garage and kitchen, has a place for everything, everywhere you turn. 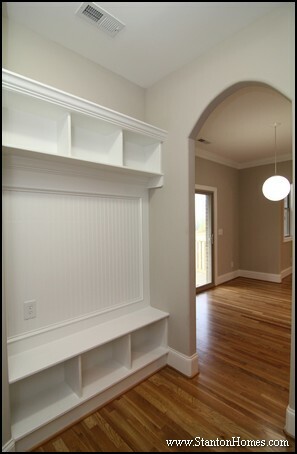 The full wall of custom, elegant built in shelving offers open concept storage. A set of storage hooks are great for coats, purses, and even keys. A sink cabinet is designed for easy clean-up, preventing dirt and grime from being tracked into the home. Cabinets above the washer and dryer offer storage that's more hidden. Low-maintenance custom tile flooring makes clean-up easy, too. 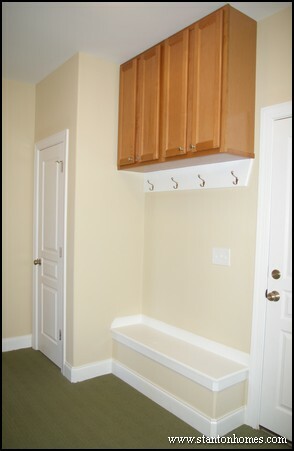 A locker style storage systems with cabinets, hooks, and bench add functionality to this mudroom. The green carpeting (great for hiding traffic patterns) is designed for indoor/outdoor use. Tucked-in closet storage is perfect for tall items to be kept out of sight. The perimeter of the room is wrapped in cabinets and built-in countertops. Tall cabinets are designed to house large cleaning tools and supplies. 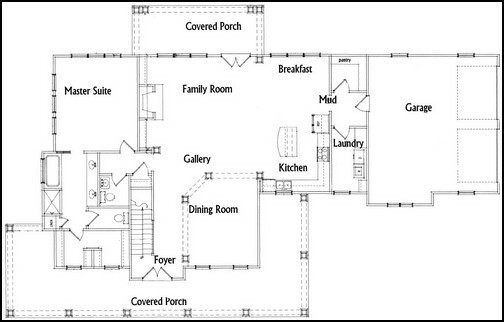 Floor plans with a mudroom are a popular request for Raleigh custom home buyers. From drop zones and locker systems to tile flooring, sinks, and folding counter tops, a mudroom offers all the storage and utility space you'll need. What does your family need to get out of your mudroom? Let us know what mudroom features you'll want most in your new home, and we'll show you more ways to design your floor plan.